Charles Truman Wesco went home to be with His Lord and Savior while serving the Lord as a missionary in Cameroon, Africa on Tuesday, October 30, 2018, at the age of 44. Charles was formerly of Warsaw, Indiana. Charles was the firstborn of ten children, son of Virgil and Rebecca (Walter) Wesco of Mishawaka, Indiana, born on August 24, 1974, at K.I. Sawyer AFB in Michigan where his father was serving in the military. He was named after his grandfathers: Charles Walter and Truman Wesco. He grew up as a pastor’s child in churches in the Midwest. As a boy, he loved reading, building forts, romping in the creek, and helping rake leaves and take down trees at his grandparents. He faithfully invested in the lives of his younger siblings as they were all home schooled together. Charles also developed many construction skills as he helped his family renovate and add on to their home. His parents instilled a love for memorizing God’s Word in him at an early age, encouraging him to learn the book of Jonah to earn his first study Bible. He completed 15 years of Bible Memory in the AWANA program receiving the Citation Award. Beyond that, he committed to memory a large part of the New Testament and many large passages in the Old Testament. That love for learning and studying God’s Word lasted his entire life. Charles accepted Jesus Christ as his personal Savior from sin at the age of 4. It was then that he asked God to forgive him of his sins and placed his trust for salvation from sin and hell in Jesus Christ. By the age of 8, he knew that God wanted him to serve in some sort of ministry, and at the age of 15, under the preaching of Pastor David Miller at First Baptist Church in Mishawaka, Indiana, he surrendered to go wherever God wanted him to go. Charles loved working with children and was actively involved in his church’s AWANA program for many years. When he was 12 years old, his grandparents gave him a tuning hammer, and he began tuning pianos at Walter Piano Company owned by his grandparents, Charles and Barbara Walter. Charles learned how to tune pianos and worked and saved to prepare for a family. Piano tuning and repair also supported him when he served in ministry. He attended Midwest School of Theology, Northland Baptist Bible College, and Baptist College of Ministry to receive Bible training. He was very musical playing the piano, accordion, harmonica and euphonium. At age 29, Charles fell in love with Stephanie Williams from Warsaw, Indiana. In God’s providence he tuned the piano of Pastor Don Williams who happened to be Stephanie’s father. Their piano apparently did not hold tune well, and his visits became very frequent and led to Stephanie becoming the love of his life and his loving wife. They married on November 20, 2004 at First Baptist Church, in Mishawaka, Indiana. The Lord began blessing them with children which ended up being 8, with 3 babies also in heaven. They enjoyed almost 14 years of marriage together. Charles served as an assistant pastor at Fellowship Baptist Church in South Bend, Indiana for 10 years. He loved working with the young people and started a Bible Institute to help see them trained and equipped to serve the Lord. It was his heart’s desire to see young people have a walk with God and to be surrendered to Him. He also served at Believers Baptist Church in Warsaw, Indiana for the past five years, during which time he was ordained and commissioned as a missionary. 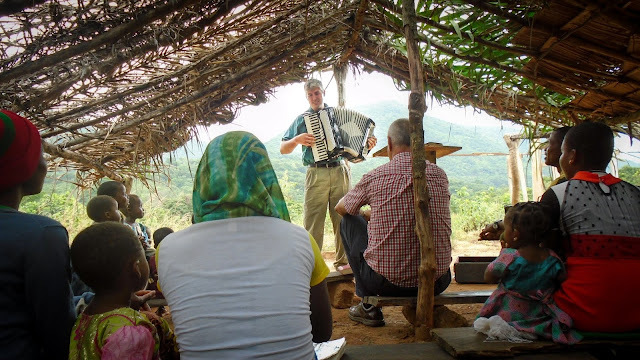 In 2015, Charles, Stephanie, and their 2 oldest sons, Daniel and Charles Jr. went on a survey trip to Cameroon, West Africa, believing the Lord was leading them to serve in mission work there. During that time the Lord confirmed their calling through direct answers to prayer, and they spent the next couple of years raising support to return to Cameroon. The Wesco family arrived in Cameroon on October 18, 2018. Charles was so excited. On October 30, 2018, Charles gave his life for the people of Cameroon, West Africa. He is with his Lord and Savior who he faithfully loved and served and has received the martyr’s crown. He is survived by his wife, Stephanie and 8 children–Daniel, Charles Jr., Joseph, Hudson Taylor, Stephanie Joyanna, Samuel, Caleb and Emmeline. His parents, Virgil and Rebecca Wesco, and siblings–Jonathan, Virgil Jr., Ruth, Stephen, Timothy, Nathaniel, Karisse, Lawrence and Joel, as well as in-laws and many nieces and nephews. His grandparents, Charles and Barbara Walter. Also surviving him are his wife’s family, who dearly loved him: Donald and Wenda Williams, Faith, Grace, Stephen, Hope, Joy, Mercy, Mary, John, Daniel, in-laws, and nieces and nephews. He was preceded in death by his grandparents, Truman and Zelma Wesco and 3 children, Hosanna, Peace and Rose. Charles loved all of his family dearly and desired that each one would love the Lord God with all their heart, soul, mind and strength. Private family services will be held and he will be laid to rest at Oakwood Cemetery, Warsaw, Indiana. Charles' life will be celebrated with a public memorial service to be held at 1:00 p.m. on Monday, November 12, 2018 at Community Baptist Church, 5715 Miami Road, South Bend, Indiana 46614 and officiated by Pastor Randy King. Memorial donations may be directed to Wildewood Baptist Church, 3030 Witzel Avenue, Oshkosh, Wisconsin 54904 to go towards the Wesco Family Benevolent Fund. We share your grief and pray that the Almighty Father will grant you solace! Our message/devotion for this Sunday centers largely on the sacrifice of Charles in service to his Lord and Savior. copies available for the asking. May God.give you peace, as only he can, in this time of sorrow. Prayerfully sharing in the worshipful service from Middle Tennessee. Many in our church family are praying for you. follower of Christ in fellowship at Franklin Road Baptist in Murfreesboro, Tennessee. Mrs. Wesco we are praying for you and the children. We have a loving Heavenly Father and His plans for us are always good. Truly sorry for the loss of a great man. He will be missed! I didn’t get to se the live stream is there a dvd that can be purchased of the service? ?